So it seems my reviews have become like the proverbial London bus as in you wait so long for one to come (I know nobody really waits for my reviews, but hey), then two come along in quick fashion. I’ve only been to London about three times however, and I never got on a bus so I have absolutely no reference point. This is a good start. Anyway, “The Bermuda Triangle” is the first Rene Cardona Jr. film I’ve decided to review. It’s certainly not his most schlockiest release (“Beaks: The Movie” wins that title hands down), but it is the film I’ve enjoyed most of which I’ve seen from RCJ to date. He is one of those directors that could churn out four or five films a year and I’ve only seen a handfull so far, this needs to change. On a side note, I’ve never really classed this as a very obscure film, but it’s IMDb page makes me rethink this as they have the wrong poster. 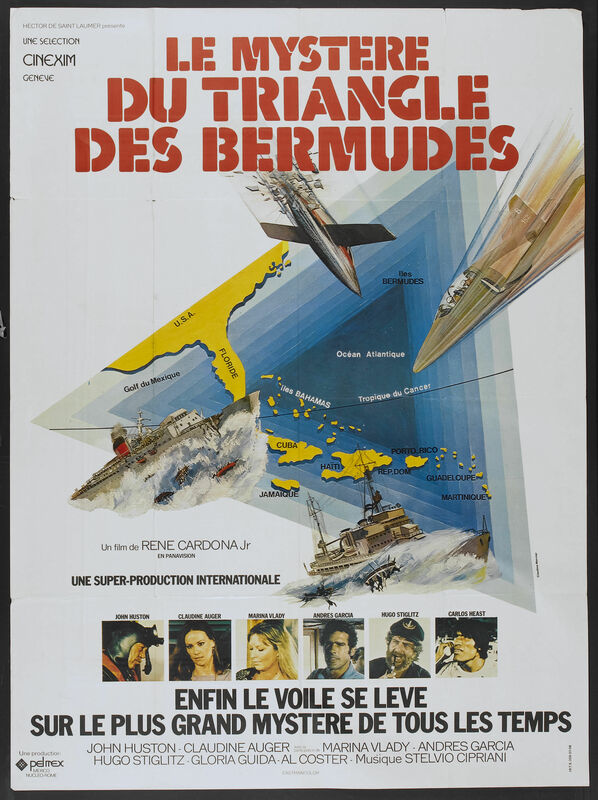 They have the one for “The Bermuda Triangle” (1979), direced by Richard Friedenberg instead. Maybe someone should tell them. Yes, this is the first appearence for Mr. Cardona Jr. on this blog, but hey, there’s a recognizable face in the form of Hugo Stiglitz (Nightmare City) who stars alongside John Huston, yes that John Huston, the one who directed all those Humphrey Bogart films, winning an Academy Award in the process, he’s actually in this, and Miguel Angel Fuentes, who you may remember fighting Mr. T in the first episode of The A Team. 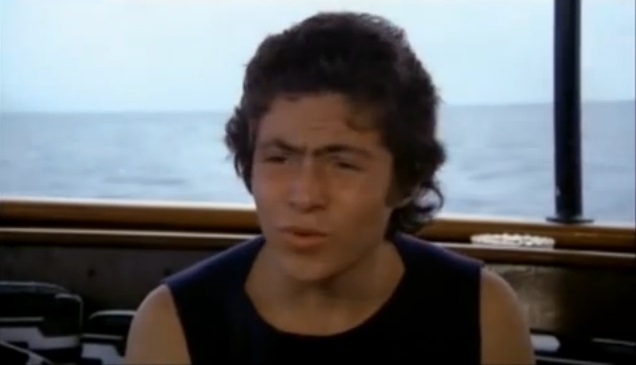 Andres Garcia and Gloria Guida, who might just be the sexiest girl in the world ever, also star, but it’s Stiglitz that steals the show in my opinion as the boat’s captain, Mark Briggs. Right then, it’s time we met all of the characters I think. There’s the boat’s captain, Mark Briggs, his two other crew members Alan (Garcia) and Tony. Simon the cook and Gordon (Fuentes) who works down in the engine room. Huston plays Edward who’s a passenger on the cruise along with his wife Kim, daughters Michelle (Guida) and Diana and sons Dave and Billy. There’s also a bickering couple along for the ride called Peter, who’s an alcoholic doctor and the half brother of Edward, and his wife Sybil. So there’s quite a few characters to meet, but we’re not introduced to the majority of them just yet. Oh, and one more thing before we get into this, I want you to keep in mind that IMDb classifies this film as a U, so let’s see just how “suitable for all” this really is. We first see Diana, Edward and kim’s youngest, on the top deck of the boat. She sees something floating in the water and tells Kim, who immediately alerts Edward. Tony fishes it from the sea and it turns out to be a doll, and a hideously creepy looking doll at that. We then cut to a naval air force squadron that have the lamest mission I’ve ever heard. Their mission, if they choose to accept it, is to fly 160 miles East from Florida in a straight formation, then turn north and return to base. Scary Darey. Of course though, they frig it right up and drive their planes into the Bermuda Triangle where they lose their bearings and perish. Oh well, that’s what redshirts are for I guess. We’re back on the boat where after Edward lets Diana keep the doll, we join Michelle and Billy entering the bridge to see Alan. Billy’s anout ten years old so he starts asking loads of questions about driving boats and stuff while Michelle is standing in the doorway in a skimpy red bikini. This pleases Alan. Eventually the kid gets bored and wanders off leaving Alan to flirt with Michelle. This seems to go down well because she smiles, and as she walks off, Alan takes this chance to have a good look at her behind. Can’t blame him really. Soon after this there’s a conversation between Dave and Edward, then another between Billy and Tony and it’s at this point that I realise that both kids, Dave and Billy are dubbed by the same person. Oh dear. Now we join Simon and Diane in the galley (that’s a ship’s kitchen, see I do know stuff) and she tells him that her doll is hungry and that she wants some raw meat. Simon asks her if she wouldn’t prefer a cookie, but she says no and demands the meat, so Simon concedes and gives her some. Nothing weird about that then. Capt. Briggs goes down to the engine room to see Gordon, the native American engine room guy, who tells him that he gets jumpy around these waters. Briggs reasures him that they’ve cruised these parts over fifty times since he joined the crew and nothing bad has happened. but Gordon, in stereotypical American native fashion, insists they’re doomed. Nothing weird about that then either. Ahhh! For the love of God throw it back in! Back in the bridge, Briggs and Alan hear a passenger plane crash in the sea over the radio. We then cut to a navy ship that have heard about this and an officer tells the captain that the majority of the passengers on the plane are family members of naval personnel. The captain looks on the map and realises his worst fears, the plane crashed in the Bermuda triangle. Unfortunately we never see these people or anything to do with this navy ship ever again, so you can basically forget everything I’ve just written about them. Oh well, what’s Peter and Sybil up to at this point? Oh, they’re bickering, and with that, we get all the exposition dialogue we need about Peter and how he turned to drink after killing a child on the operating table. The exposition really comes to a head when Peter refers to Edward as “that fool of my half brother” just so we know exactly where we all are. Nice one Peter. So it’s night time now and we see Alan and Michelle together on the deck looking at the stars. Alan’s starting to look more and more like a chubby Bruce Campbell in every scene. I need to mention at this point that the person who chose the decor for this cruise ship might have been somewhat disturbed as there’s pictures of sea monsters eating ships covering the walls. Creepy Diana tells Peter she reckons one’s going to come out of the sea and devour them all before Kim enters with the doll telling Diana that she found it in the hallway. Diana tells Kim she definitely left in the chair. So is this film about a possessed doll now or what? I sit down to watch a nice Bermuda triangle based disaster film and what do I get? Bloody Birdemic: Shock and Terror! We join the passengers eating dinner and listening to a pleasent radio broadcast about all the ships and planes that have gone missing in the Bermuda triangle. Peter, who may or may not be drunk at this point, claims it must be due to sea monsters and space aliens. Diana agrees and throws in the Devil for good measure. David says something but I got distracted by his ridiculaous eyebrows, he looks like a wolf boy. The discussion continues until Briggs puts everyone at ease by saying it all comes down to crap driving, but as soon as he says this, a load of green parroty type birds attack Diana who’s wandered outside. The rest of the gang rush out to see a load of dead birds on the deck and Peter notices that all their throats have been cut and their heads are hanging off. Yeah, I can’t make sense of it either. Suitable for all by the way, kids. As Kim calms Diana down in their room, Edward takes the doll from her and notices there’s blood all round it’s mouth. Soon after this, David has a nightmare involving a pilot who’s apparently trying to tell him something. I really don’t know what I’m supposed to be wary of in this film. Sea monsters? Aliens? Ghost airmen? Birds? The Devil? The creepy doll is still top of my list though to be fair. Briggs notices a light in the distance signalling for help, but as he approaches it, nothing shows on the radar. Alan joins Briggs and Tony in the bridge and tells them that the signal lamp identified itself as a boat that had gone missing a hundred years ago. Eventually the light disappears and I add ghost ships to my list of things to be wary about. Lady pilot and the sexist, just more Bermuda triangle fodder. It’s the next morning and the passengers are preparing to go scuba diving to take picures of some underwater ruins, this displeases Gordon and he basically tells David that if he messes with the sea, there’ll be dire consequences. Cut to another plane with a man and woman in the cockpit. Our introduction to them is the guy saying “I must confess that I almost decided not to make this flight when I found out the pilot was a woman”. 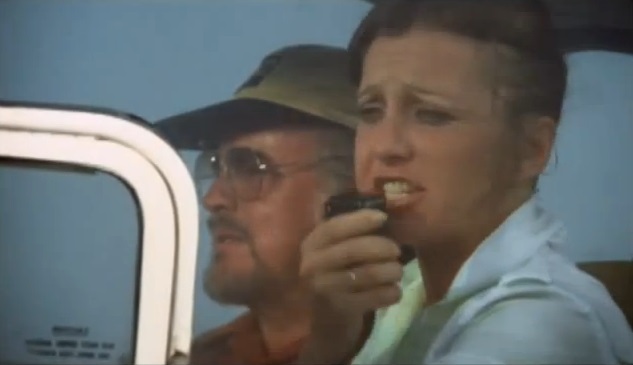 After reassuring him that she is fully lisenced and has plenty of flying hours under her belt, the little lady pilot manages to fly her plane into a load of fog and immediately starts panicking and calling mayday over the radio. Alan sees her plane on the radar, but then it’s swallowed up by a weird orange light and disappears. I guess the guy was right, you can’t trust these women pilots. Added orange lights to the wary list. So we come to the scuba diving scene which is a bit rubbish for two reasons, the first one is because it’s really hard to distinguish one character from the next as they all have masks on, and the other reason is because we see real stock footage sharks getting harpooned for apparently no reason, maybe we were supposed to think the divers were in danger, whatever, they show the poor sharks dying slowly in close up shots (remember, suitable for all). I like sharks. Anyway the underwater scene goes on for ages and every now and then cuts back to what’s going on in the boat, you know things like creepy Diana locking Simon in a freezer, that kind of thing. Also it’s at this point that the drunk child murderer Peter is the only one talking any sense by actually bringing up the fact that boats and planes have been going missing, and birds are deciding to attack their boat, which may just indicate that they could be in a spot of bother. Kim and Sybil brush this off as crazy talk. Women! I refuse to show images of dead sharks, so here’s a picture of Michelle in her bikini. Peter storms off to the kitchen and opens the freezer to find a very cold and unhappy Simon. Simon tells Peter how scared he was but in walks Diana to reassure him that it’s okay because he’s going to die a different way. Simon now thinks she’s the Devil. Back in the water and our diving friends, after taking out the local shark population, eventually come across the ruins. Seriously, judging from the time it’s taken them to get there, they must be miles away from the boat by now. So they start taking pictures and what not, until there’s a huge sea quake thing which makes all the ruined pillars fall around them. This causes a lot of disturbance on the surface which is right back near the boat, I’m guessing then that they just went in a massive circle destroying sharks for fun. One of the pillars falls on Michelle’s legs, trapping her. As Edward and Briggs try to help her, Alan resurfaces and tells the others what’s going on, gets a full tank of air, then heads straight back down. Well that was quick, why did we have to watch them swimming around for the best part of fifteen minutes? It’s things like this that are the reason “The Bermuda Triangle” is just short of two hours long, I just don’t need it. Eventually Michelle is rescued but her legs are written off and Peter says there’s not much he can do, they’ll have to get to the nearest island which is Bimini. Meanwhile, Diana is talking about death again with her brothers and Sybil. She claims she’s been speaking to a man that none of the others know, who told her how everybody’s going to die, claiming Simon (the black, comedy relief chef) is going to die first. Fair bet I’d say. I don’t know who the man was that she was talking about, but he’s officially wary listed now too. Suitable for all, how do you like the film, kids? Later that evening, Peter tells Sybil that Michelle’s legs can’t be saved and she may not even make it to Bimini alive. Sybil, and later Capt. Briggs tell him to try and save her but he’s having none of it so Briggs calls him a coward. That night Alan tells Briggs that he can’t make contact with Biminy and that there’s a storm on the way, so he tells the others to stay in their cabins. Diana comes out of her room and tells Edward that her doll is thirsty so she’s going to the kitchen, but Edward takes the doll from her, puts it on a chair and sends her back to bed, we then see the doll start moving by itself. This isn’t going to be a comfortable night for the passengers I feel. When the storm hits, the boat comes into contact with some rocks that really shouldn’t be there according to Briggs, and the engine room springs a leak, so Gordon gets to work fixing it. Meanwhile Edward and Kim, who somehow both fell asleep as the boat is going mental, discover that Diana is no longer in her bed. They leave the cabin to go looking for her and find her standing on the top deck like the weird little girl that she is. They try and reach her, but a big wave hits them both and they’re thrown into the sea. Gordon takes Diana back to her cabin as Briggs and Tony search for her missing parents in a lifeboat, but they return the next morning empty handed. …and that’s the end of Gordon, kids, why are you crying? As the passengers watch the returning boat, Diana is standing with them and we see a close up of the doll and well, the doll seems to have turned into a real little girl with a very angry look on her face. That was particularly creepy. It also turns out that during the night Simon died because he “fell on a bottle and cut his neck” in the galley. yeah, that seems plausible, especially when Peter finds the doll right next to his body. A bit later, after telling him to stop calling Diana the Devil, Briggs tells Gordon that he must fix the propeller which means he must get into the water. As he’s doing this of course, the engine is turned on and the propeller tears him to shreds turning the water red with blood (suitable for all). Alan sprints down to the engine room to turn it off and who’s sitting right outside the door? Diana and the doll. Briggs joins Alan but they can’t seem to shut off the engine until suddenly it stops by itself as Diana enters. Briggs asks her if she turned it on but she says it was the doll. I can’t believe nobody’s thrown the damn thing back into the sea at this stage. 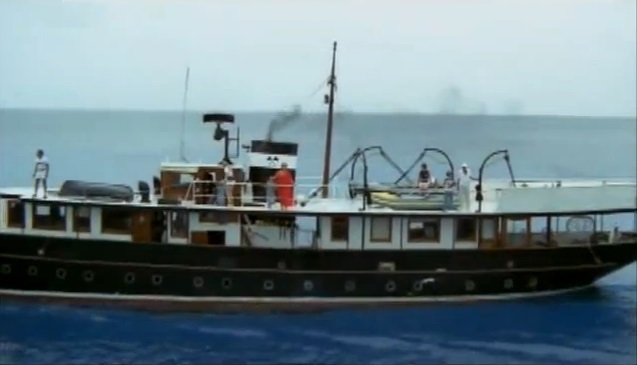 So with the boat now damaged and adrift, Alan tries to call for help on the radio, but all they hear back is other distress signals from around the area including the passenger plane from before, and more disturbingly, one from their own ship. None of this is really helping the ever weakening Michelle, so Alan and David decide to try and take her to the nearest island in the lifeboat. As the others wait around for help, Billy tells Peter he thinks his sister may be bewitched. Peter explains that she probably is but it doesn’t really matter because they’re all going to die anyway. Top babysitting skills. Yeah, I think the doll might be evil. It’s night time again and Sybil is on the upper deck enjoying a nice cup of coffee when she’s suddenly surrounded by fog and Diana appears, telling her that “it’s them”. 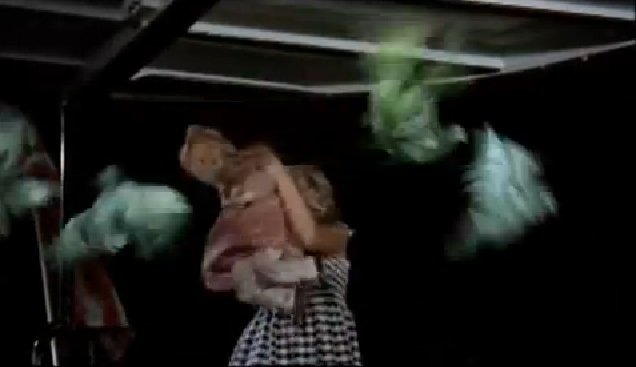 Peter goes up to look for her but she seems to have disappeared, we then see Diana smiling at her doll, who’s turned back into the angry little girl and now has blood around it’s mouth. Briggs tells Peter they should look for Sybil, but Peter says it’s not worth it, she’s gone like the others. The next morning on the lifeboat, David wakes up to find that Michelle has died. Alan stops the engine to take a look at her and confirms her death. Upon trying to start it up again however, he realises it’s having none of it, so he and David start rowing back. 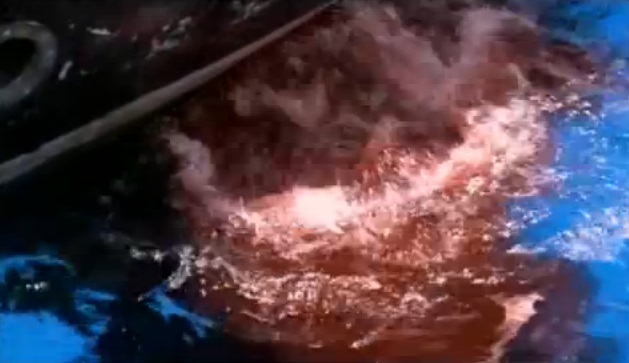 All of a sudden a huge shape appears under their boat… Cut back to Briggs who’s still trying to get through to Biminy when, well how about that, he finally get’s through. He tells them that they’re Black Whale III and that they’re set adrift, but after hearing this, the guys in Biminy say that he must be mistaken because… that ship, it’s crew and all it’s passengers disappeared twelve years ago. The Black Whale III then starts fading before it disappears completely into thin air and all we see is the doll floating in the water. I couldn’t end this review without showing a picture of wolf boy David. Indulge. After some rolling text listing the real ships and planes that have gone missing in the Bermuda triangle, the film ends and I’m left to wonder how exactly to describe what I’ve just seen. It’s far from a bad film actually and I did pretty much enjoy it, but it did maybe take itself too seriously, although the seriousness of the acting was an actual strength of the film, but then it has weird scenes like when the birds attacked that didn’t really make sense, and this is also kind of a strength in a way. See I’m struggling. I’d have to recommend “The Bermuda Triangle”, but at the same time warn of some boring bits and of course, the shark deaths. I’ve also just looked at my list of things to be wary of in the film after adding timeslips and got frustrated to the point where I tore it up, I think that says a lot. Cheers! This entry was posted in Film Reviews and tagged animal snuff, Animals, boat, dimensions, drama, Hugo Stiglitz, isolation, Italian, John Huston, Mexican, mystery, ocean, Rene Cardona Jr., sharks, stock footage. Bookmark the permalink. Have you noticed about Gloria Guida? 3-	Have you noticed the poor acting reaction when Michelle is told her parents died during the storm? So, the post teen Michelle just learned her parent are gone, that she will have both legs amputated while back on land, but all she has to say is “poor papa and maman” while shaking her head slowly.